Coming this November, the second half of Breaking Dawn marks the final chapter in the fantasy romance, as Bella and Edward seek to spend the rest of eternity together. However, their love story may not have a happy ending, as the Volturi discover the birth of Bella and Edward’s daughter, Rosemede, and seek to fix the problem. To protect their daughter, Bella, Edward and Jacob form an alliance of werewolves and vampires in order to protect the young girl from the dark forces. After days of slowly revealing the poster on Facebook, the final reveal is at last here and it is… exactly what I expected it to be. The poster features the three main characters front and center with random characters in the background all charging forward. It comes as no shock that the major money shot of the film turns out to be the final poster. But therein lies the biggest issue. The fact that Summit Entertainment took the time to build up this poster, slowly revealing it through an assortment of images; and all that was given was not worth the hype. If anything, the poster does make sense, and the issues come to no surprise. 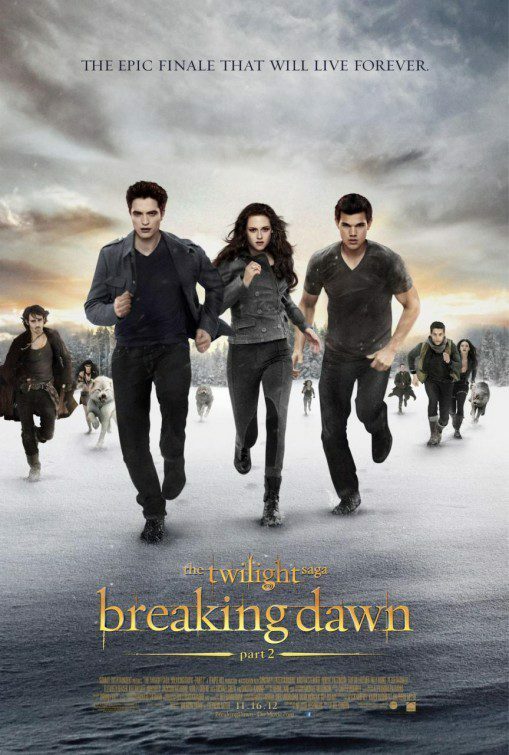 The finale of The Twilight Saga, Breaking Dawn Part 2, comes to theaters November 16th. Here’s a look at the full poster – what do you think of it? Leave your comments below.